A Hulk stand-alone movie? Not so fast! While Mark Ruffalo has been talking a lot about the possibilities of the green goliath getting his own new solo film, that may be further away than we think. And remember what the actor said /mark-ruffalo-doesnt-want-a-planet-hulk-movie/yesterday? That he doesn't want a Planet Hulk movie? Well, it seems he may be trying to throw the scent of what is actually happening with the character. Because Hulk will return before The Avengers 3. But not in his own movie. Hitfix, who recently visited the UK set of Avengers: Age of Ultron, learned a lot about the storyline of this upcoming sequel to 2012's Marvel's The Avengers, including the ending of the movie. And it climaxes on a story point many fans are expecting, but maybe not quite how they expected. Stop reading if you don't want to know anymore about Avengers: Age of Ultron! Major SPOILERS!!! lie ahead! Hitflix explains that the ending of Avengers: Age of Ultron helps to set up Captain America 3, Thor 3 and Guardians of the Galaxy 2. Joss Whedon's script is revealed to be both a complete story, and one that has much broader strokes that extend into the greater Marvel Cinematic Universe. 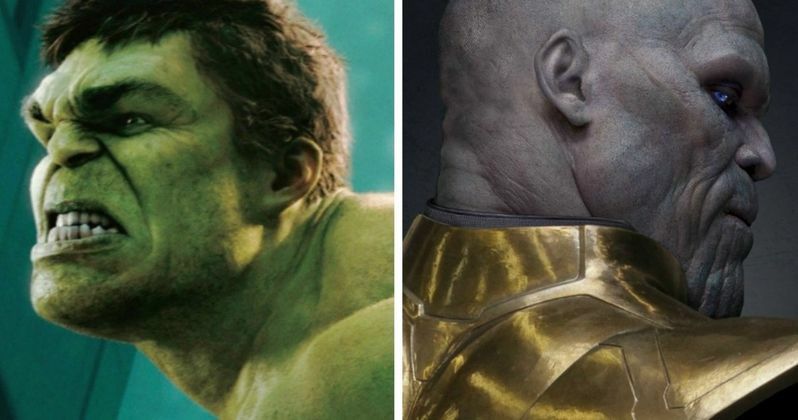 There will be no Planet Hulk movie, for a fact, but fans of the character will be extremely happy with Marvel's plans between the next two Avengers sequels. Bruce Banner plays an extremely important role in Avengers: Age of Ultron, with Hulk a key figure in the climatic end battle sequence between Ultron and the Avengers. The fight will spill out of the virtual realm and into real life. To vanquish the android, Hulk must board a Quin jet that is being shot off the planet and into deep space. There is no way to turn the ship around, as it's been preprogrammed and Hulk is powerless to stop it. Now, all of that is considered fact, not rumor as it was confirmed after Hitfix visited the set. The next part of where this story goes is part speculation based on what is known about how these franchises plan to move ahead with one overall arcing storyline. And that includes pulling Guardians of the Galaxy into the bigger mix. The Quin jet is rumored to take Hulk to wherever Star-Lord and his team are hanging out in the universe. It is here in Guardians of the Galaxy 2 that various parts of the Planet Hulk storyline may play out as Banner's ship takes him to another planet. The Guardians will end up having an adventure with Hulk, but the bigger story in this sequel will be to get Hulk back to his home planet of earth. The Guardians end up coming with him, which gives cause for Thanos heading to our world, where we will see him become the main villain in The Avengers 3. Bottom line is that Mark Ruffalo isn't lying when he says there will be no Planet Hulk movie and can freely state as such in the press. But fans could very well see elements of that storyline play out in the other upcoming Marvel sequels, specifically Guardians of the Galaxy 2. What do you think of these developments?